Aug. 19, 2011, 2:30 p.m. The Gray Lady gets a new outfit from a former developer. By Andrew Phelps Aug. 19, 2011, 2:30 p.m.
Redesigning a news site is simple — that is, until you add in the content, ads, in-house promotions, comments, departmental politics, and performance issues. It’s an uncluttered, iPad-inspired look (a lot like the Times’ newish Opinion Pages). Headlines and body text are set in Cheltenham, the Times’ serif of choice since 2003, instead of plain-vanilla Georgia. He also cut out a lot of the ads, which is the most common bit of criticism he receives about Ochs. 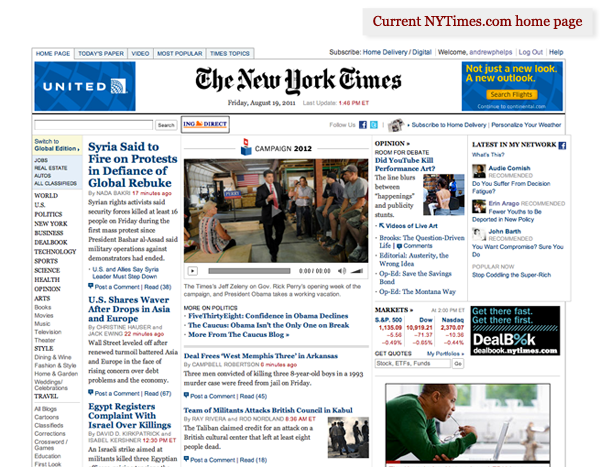 On the NYTimes.com homepage today, I count 12 display ads, seven of them in-house ads. On Donohoe’s version of the same page, I count one. While he’s at it, though, Donohoe is thinking out loud about improving the ad experience. He is resurrecting some ideas from the very early Times redesign days, back in 2005, the no-such-thing-is-a-bad-idea days. One idea is what he calls “progressive advertising” (or perhaps regressive advertising), wherein a user sees fewer and fewer ads the longer he navigates the site. And then there’s the idea of hiding ads for paying subscribers, which the Times rejected early on. “There are definitely people who thought, ‘Well, I paid for the Times, I shouldn’t see adverts.’ I’m in that camp, personally,” Donohoe said. Then again: “You could argue that people are willing to pay for the Times, so they are a more and more valuable audience for the Times” (and its advertisers). POSTED Aug. 19, 2011, 2:30 p.m.
Phelps, Andrew. 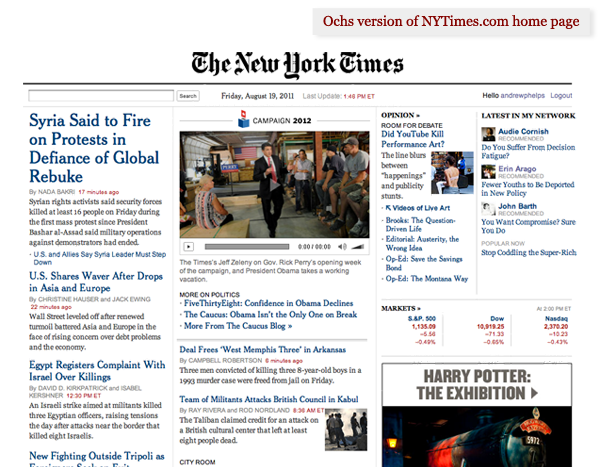 "Meet Ochs, a Chrome extension that dresses up the NYT." Nieman Journalism Lab. Nieman Foundation for Journalism at Harvard, 19 Aug. 2011. Web. 18 Apr. 2019. Phelps, Andrew. "Meet Ochs, a Chrome extension that dresses up the NYT." Nieman Journalism Lab. Last modified August 19, 2011. Accessed April 18, 2019. https://www.niemanlab.org/2011/08/the-nyt-gets-another-new-design-this-time-via-chrome-extension/.